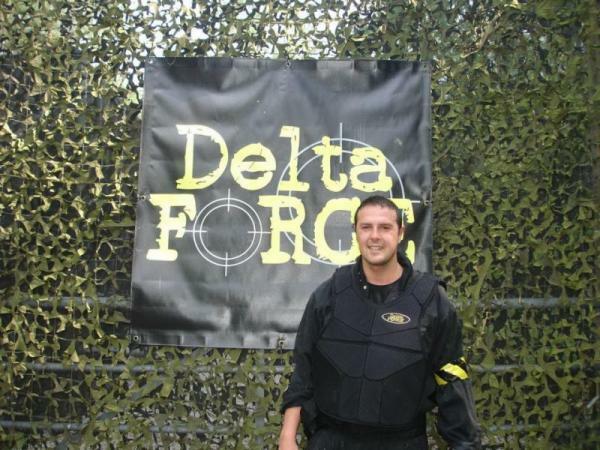 Anyone who’s been following our Facebook posts or has taken a passing glance at the Delta Force website will know that we have our fair share of big names book in for a game every now and then. Predictably, our regular customers are always itching to know who from our glitzy guest list has been the best paintball player in the years since Delta Force welcomed its first celebrity (we can’t quite remember who it was, but if you manage to dig up a celebrity hotlist of 1989 you might get an idea who it could have been). The truth is, there is no categorical way to define who the best player is – sadly, we don’t make Delta Force Match Attax cards with strength/agility points – but what we can do is compile a list of the most memorable celebrity players. With all its guns, grenades and gung ho attitude, it is very easy to mistake paintball for a predominantly male-oriented game. Thank God for Elle MacPherson, who did a fine job at reminding us all that women are just as good (if not better) at this action-packed sport. 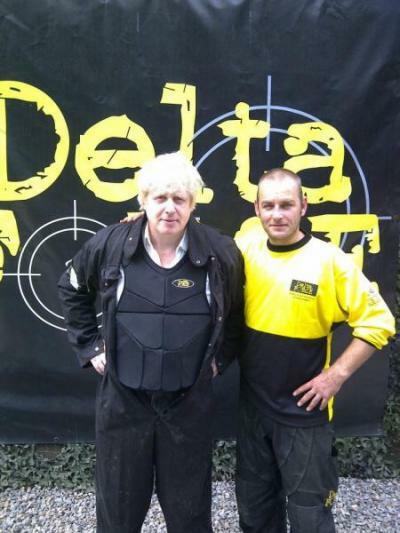 Treating her son to a wicked junior paintball birthday party, the Australian super model came in, played host, played the games and even took the time to pose with the Delta Force boys for the cameras. We’ve all been hopelessly in love with her ever since. Having Jensen Button and Lewis Hamilton book a game at one of our centres is already, to quote a legendary anchorman, “kind of a big deal”. To have them turn up at our centre and compete against a group of journalists who often give McLaren savage reviews is mouth-watering. Which is why all we had to do was kit them up, sit back and watch the action unfold before our eyes. End result? One of the most memorable “paintbaths” in recent memory and our coolest, slickest photo shoot to boot! Do you know why the Terminator never travels back in time to Bolton? Because that’s where Paddy McGuinness lives. Admittedly, the Take Me Out presenter does not look like the kind of guy to gun down a hulking cyborg warrior from the future… and yet he surprised us all with his hawkeyed aim and action star quips (“You can’t compete with concrete”) as he reduced our Terminator to a pile of scrap in our toughest game zone, Speedball Arena. Feel the steel indeed. 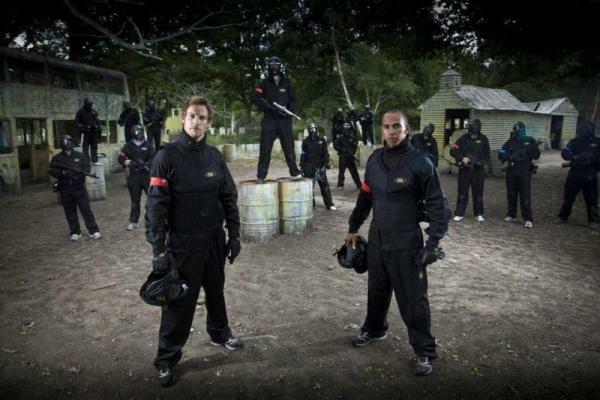 The newly crowned UEFA champions proved they’re just as handy with paintball guns as they are with a football. 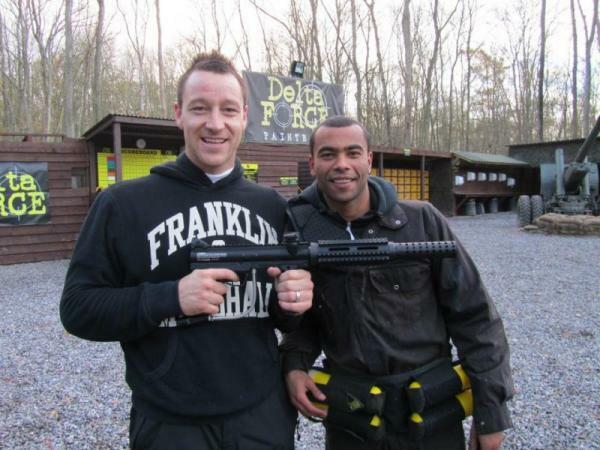 All the players who happened to be footie fans swooned at the sight of John Terry, Ashley Cole and Didier Drogba hanging out at our centre, but nothing prepared us for the scene that occurred in the paintball arena. In a moment of pure action movie bliss, Cole dove over a prop to reach a crouching Terry and proceeded to tag him with paintballs mid air, before landing with a gracious roll. Many of us joined Delta Force in the vain hope that we’d witness sights like these someday. Now we have, thanks to Cole and co. And for that reason alone, Chelsea takes the top spot. And there’s our list. But what celebrity would you like to compete against in a paintball game?? You know where to post your answers!